Like other pit vipers they use heat-sensing pits to detect warm-blooded predators and prey. Black-tailed Rattlesnakes are olive-brown to yellow-brown in color and can be up to 48 inches long. They have a series of large black or brown blotches on the back, which appear jagged edged. The tail is black and sometimes is faintly banded. Their neck is slender and the head is broad and triangular. On the end of the tail is a rattle composed of a series of loosely interlocking keratinous sections. A new section is added each time the snake sheds its skin. These sections sometimes break off so it is not possible to age a rattlesnake by counting the number of sections found in its rattle. They feed on mice, rats, rabbits and other small mammals plus birds and lizards. Mating takes place in July through September and 3-16 young are born live during the monsoon season. They are primarily diurnal and crepuscular in the spring, fall and winter but become crepuscular and nocturnal during the hot summer months. Like other pit vipers they use heat-sensing pits, located between the eyes and the nostrils, to detect warm-blooded predators and prey. 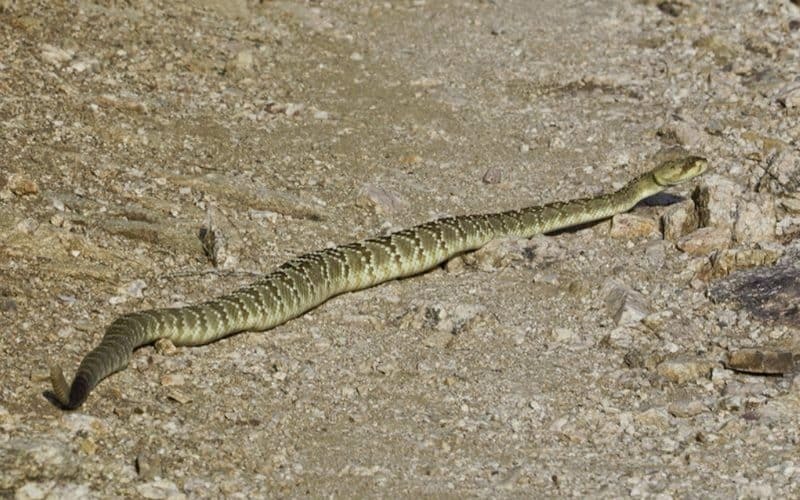 Black-tailed Rattlesnakes are common in Sabino Canyon. The author has personally seen 5 in lower Sabino and one on the tram road up near tram stop 6. Two of the lower Sabino sightings were inside the riparian area where we take the school children. Always make sure an adult leads the group and stress the importance of remaining on the path. This photograph was taken, early morning, on August 2012 along the Bluff trail.